Building Smart Grids is a highly complex task that begins with a detailed quantitative assessment of the system requirements, definition of actual targets and their required performance levels, and specification of system concepts and equipment. 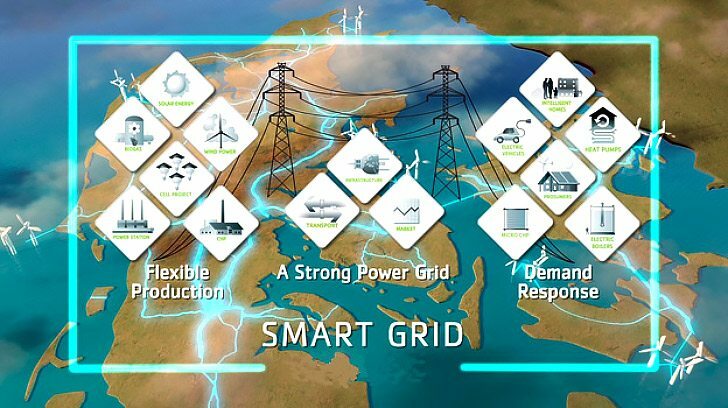 As a result, a comprehensive strategy for building Smart Grids is necessary – including the part of the network that addresses power supply systems. The foundation for designing an efficient Smart Grid is a detailed analysis of the system’s required performance. This is the key task for strategic network planning. Keeping a rigorous focus on the system as a whole ensures that the architecture and configuration deliver the necessary performance levels, and meet other requirements as well. The solution will integrate the most innovative technologies for power generation, transmission, distribution and consumption, while taking into account each system’s individual history and current condition. In most cases, the transition from today’s power supply system to the future Smart Grid cannot be made in one step; instead it requires step–by–step modification plans. 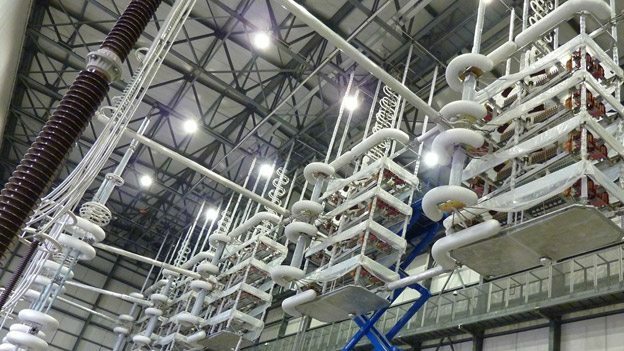 Power electronic solutions for High Voltage Direct Current transmission (HVDC) and Flexible Alternating Current Transmission Systems (FACTS) address the greatest challenges in power transmission. FACTS devices can significantly increase the power transmission capacity of existing alternating current (AC) systems and extend maximum AC transmission distances by balancing the variable reactive power demand of the system. Reactive power compensation is used to control AC voltage, increase system stability, and reduce power transmission losses. State-of-the-art FACTS devices include Fixed Series Compensators (FSC) and Thyristor Controlled Series Compensators (TCSC), orStatic VAR Compensators (SVC) for dynamic shunt compensation. The latest generation of Siemens SVC devices is called SVC PLUS. These are highly standardized compact devicesthat can easily be implemented in demanding network environments; for example, to allow connection of large offshore wind farms. AC technology has proven very effective in thegeneration, transmission and distribution of electrical power. Nevertheless, there are tasks that cannot be performed economically or with technical precision using AC. These include power transmission over very long distances, as well as between networks operating asynchronously or at different frequencies. In contrast, a unique feature of HVDC systems is their ability to feed power into grids that cannot tolerate additional increases in short – circuit currents. The transmission capacity of a single HVDC transmission system has recently been extended by Siemens Ultra High Voltage Direct Current transmission system (UHVDC). With a capacity of more than seven gigawatts and low rate of loss, UHVDC transmission is the best way to ensure highly efficient power transmission of 2,000 kilometers or more. Electrical Super Grids based on UHVDC transmission can interconnect regions across climate and time zones, allowing seasonal changes, time of day and geographical features to be used to maximum advantage. In order to begin fulfilling the climate protection requirements of 2020, we need to use energy efficiently and reduce CO2 emissions. Power generation needs to change accordingly. Large power plants will continue to ensure basic supplies, but there will also be renewable energy sources that fluctuate locally depending on weather and other conditions. At power plants, the focus is on ensuring reliable supply, using generation resources efficiently, and reducing transmission losses. As Energy Management System (EMS) handles these by balancing the demands of the transmission system, generating units, and consumption. Intelligent Alarm Processors (IAPs) reduce the critical time needed to analyze faults in the grid and take corrective action, as well as the risk of incorrect analysis. Innovative Voltage Stability Analysis (VSA) applications running automatically and independently alert the operator before critical situations that jeopardize static system voltage stability occur, giving the operator time to take preventive action rather than having to react under stress. Increased grid reliability is provided by Optimal Power Flow (OPF) applications that continuously work to keep the system’s voltage level high and eliminate invalid voltage conditions. Any control measures that must be taken can be automatically executed in a closed-loop-control procedure. The automation and protection of substations must be enhanced to securely meet the extended requirements of future Smart Grids. The substation is in the process of becoming a node on the utility IT network for all information from the distribution substation to the customer. For example, data from the feeder automation units, power quality, meters, decentralized energy resources and home automation systems will be collected and analyzed to improve the system. Besides the new Smart Grid challenges, the usual task of protection, control and automation have to remain as reliable and efficient as ever. The objectives for substations are beginning to cross departmental boundaries, encompassing operations, maintenance and security requirements. Smart substation solutions and their individual components should be designed with this overarching vision and framework in mind. Reduced costs for installation and maintenance. 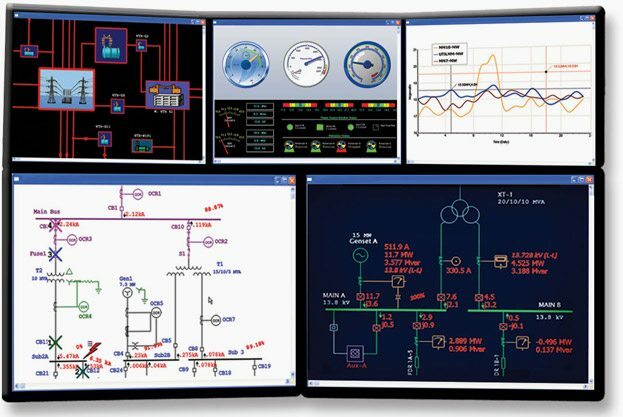 Integrated Substation Condition Monitoring (ISCM) is a modular system for monitoring all relevant substation components, from the transformer and switchgear to the overhead line and cable. Based on known, proven telecontrol units and substation automation devices, ISCM provides a comprehensive solution perfectly suited to substation environments. It integrates seamlessly into the existing communication infrastructure so that monitoring information from the station and the control center is displayed. The new Age of Electricity is characterized by a mix of both central and decentralized power generation, which requires bidirectional energy flows – including power from smart buildings and residential areas where consumers are becoming ‘prosumers’. A key prerequisite for this paradigm shift is a homogeneous, end-to-end communication network that provides sufficient bandwidth between all grid elements. Telecommunication systems for power grid transmission have a long history in the utility industry. In today’s transmission grids, almost all substations are integrated into a communication network that allows online monitoring and controlling by an Energy Management System (EMS). In a distribution grid, the situation is quite different. Whereas high voltage substations are often equipped with digital communication, the communication infrastructure at lower distribution levels is weak. In most countries, fewer than ten percent (10%) of transformer substations and ring – main units (RMUs) are monitored and controlled remotely. Communication technologies have continued to develop rapidly over the past few years, and the Ethernet has become the established standard in the power supply sector. International communication standards like IEC 61850 will further simplify the exchange of data between different communication partners. Serial interfaces will, however, continue to play a role in the future for small systems. An important element in creating and operating Smart Grid is comprehensive, consistent communication using sufficient bandwidth and devices with IP/Ethernet capability. Networks of this kind must eventually extend all the way to individual consumers, who will be integrated into them using smart metering. Consistent end-to-end communication helps meet the requirement for online monitoring ofall grid components and, among other things, creates opportunities to develop new business models for smart metering and integrating distributed power generation. Today’s distribution grid operation is primarily characterized by manual procedures that rely on the expertise of an aging workforce. Reduction of the occurrence and duration of outagesthrough the application of advanced fault location and network reconfiguration algorithms. Minimization of losses through improved monitoring. Optimized utilization of assets through management of demand and distributed generation. Reduction of maintenance costs through online condition monitoring. The smart management of power distribution grids is one of the key success factors for achieving ambitious Smart Grid goals. The prerequisite for comprehensive automation and protection design is determining the required levels of automation and functionality for distribution substations and RMUs. This could differ among the RMUs in one distribution grid or in the same feeder because of different primary equipment or communication availability. However, with or without limited communication access, a certain level of automation and Smart Grid functionality can still be realized, as can a mix of functions inone feeder automation system. Recloser controller for overhead lines, plus auto reclose breaker with enhanced protection functionality and advanced communication and automation features. The integration of distributed energy resources (DER) calls for a completely new concept: the virtual power plant. A virtual power plant connects many small plants that participate in the energy market in a completely new way. It makes it possible to use sales channels that otherwise would not be available to the operators of individual plants. Linked together in the network, the power plants can be operated even more efficiently and therefore more economically than before, benefiting the operators of decentralized generating facilities. In the virtual power plant, decentralized energy management and communication with the generating facilities play a special role, and thanks to the Siemens products Decentralized Energy Management System (DEMS) and DER Controller, are optimally supported. The centerpiece is DEMS, which enables the intelligent, economical and environmentally friendly linkage of decentralized energy sources. The DER Controller facilitates communications, and is specifically tailored to the requirements of decentralized energy sources. DEMS, the core of the virtual power plant, is equally appropriate for utilities, industrial operations, operators of functional buildings, energy self-sufficient communities, regions and energy service providers. The prediction tool anticipates electrical and heat loads; for example, as a function of the weather and the time of day. Predicting generation from renewable energy sources is also important, and is based on weather forecasts and the unique characteristics of the plants. Short-term planning to optimize operating costs of all installed equipment must comply with technical and contractually specified background conditions every 15 minutes for a maximum of one week in advance. The calculated plan minimizes the costs of generation and operation, while DEMS also manages cost efficiency and environmental considerations. A B.C. Hydro smart meter, which uses short bursts of radio waves to communicate with the electricity grid. The Automated Metering and Information System (AMIS) records the power consumption of each individual consumer over time, and in turn, consumers are given detailed information about their power consumption. 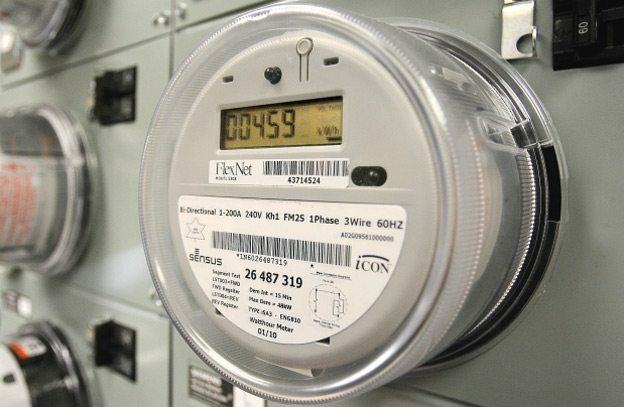 Experts estimate that the use of smart meters can save up to ten terawatt-hours of electricity, or almost two percent of total energy consumption. There is no doubt that the future belongs to the Smart Grid, and that power generation will change significantly by the time it becomes a reality. Large power plants will continue to ensure the basic supply, but there will also be renewable energy sources, causing fluctuations in the grid. In the not too distant future, flexible intermediate storage of temporary excess power in the grid will be possibleusing electric vehicles and stationary storage units. Sensors and smart meters will switchthese units on or off, ensuring efficient load management. 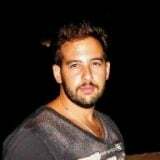 Bachelor in Electrical Engineering from Technological Educational Institute of Piraeus, Hellas. Electrical engineer working at Center of Renewable Energy Sources. I work in the field of maintenance, functional test and installation of measuring systems, including wind potential measurements in areas where wind turbines will be installed. I'm highly interested in HVDC systems, Fuel Cells technology and Microgrids. Wonderful contribution Mr. Emmanouil. Thank you very much for your detailed write up of a complex subject presented in a simple way. I am very much impressed with your presentation although not an electrical engineer but Structural Engineer working for more than four and half decade in Power Transmission Line industry . Keep it up! Thank you to the contributors! Furthermore thank you ever so much especially for caring to include the references to the authors and books , since it enables the readers to explore, research and investigate the problems with the proper approach and depth! Keep on keeping on! Actually you all present rather obscure and complex subjects in much more attractive fashion! Very good and very detailed write-up Emmanouil, thank you very much. Thank you very much Edvard.